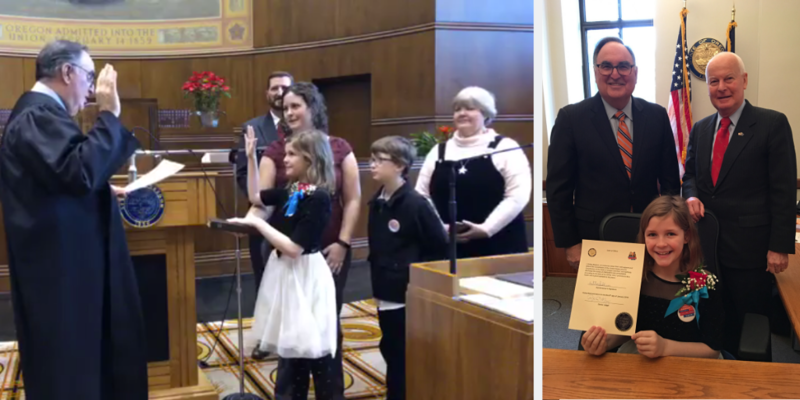 Erikka Baldwin, a fifth-grade student at McCornack Elementary School, was inaugurated as Oregon’s 2019 Kid Governor at the state capitol on January 8. Congratulations, Erikka! Erikka ran on a platform of finding forever homes for stray dogs and cats. Her classmates and teacher Karen Olsen helped her develop her winning three-point plan and campaign video. More than 1,250 fifth graders across Oregon viewed Erikka’s and the other candidates’ campaign videos and cast their votes to elect Oregon’s Kid Governor for 2019. As Kid Governor, Erikka’s responsibilities include sharing her issue statewide, writing posts for an official blog, and speaking with constituents. Her work will also promote civics awareness among Oregon’s school children. We are very proud of Erikka’s achievement and honored to have a 4J student elected as Oregon’s Kid Governor.